We’re on our third year using Sonlight Curriculum. We love it. One part I particularly like is the Timeline Book. If you’re not familiar with it, here’s how it works, how we use it, and why we love it! So what is the Book of Time? Well, when you purchase it, it’s just an empty book basically. It has a timeline pre-marked with the years, but the pages are otherwise empty for you to fill. 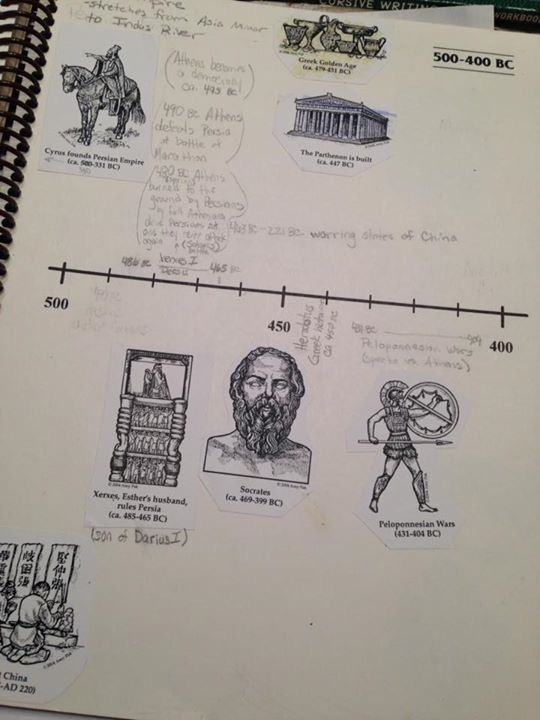 One book is intended to be used through all grades – each year building on what you did the previous year. 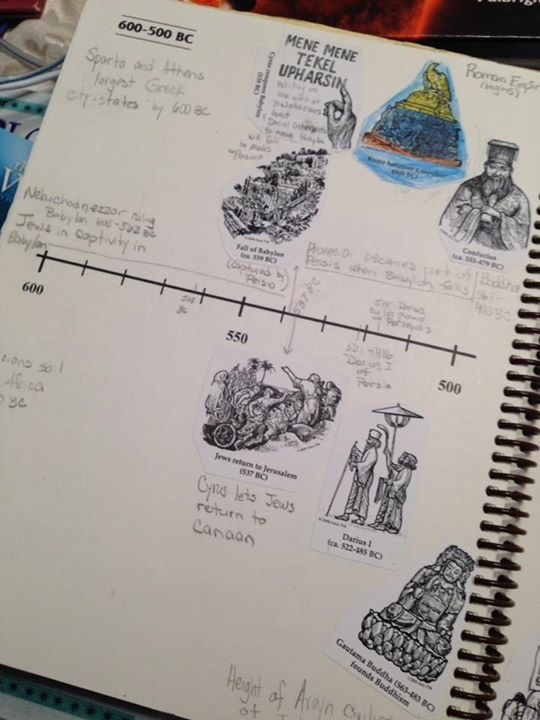 So when you’re finished, you have an incredible visual of the chronology of events in history. Sonlight has timeline stickers that coincide with the history and literature and Bible readings in each Core for you place on the timeline. But we are guilty of adding SO MUCH MORE than just the stickers with our Core and the notes it guides you to add. 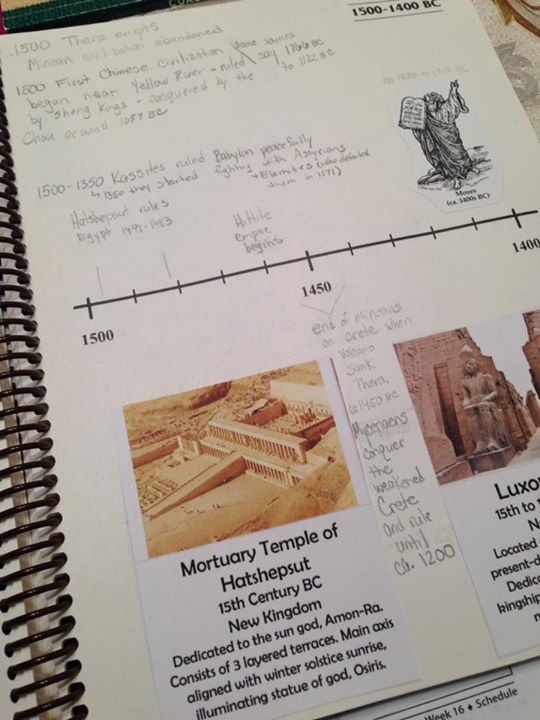 For example, when we were learning about Egypt in Core B/World History Pt 1, I found some great printables (I wish I could remember where) of Egyptian monuments and the dates of their building. We included those. I wouldn’t recommend using such large pictures for more modern historical events. But I had a feeling that the 2500-1500 BC pages wouldn’t get as full as say, the 500 to 1500 AD pages. And G really loved these images. 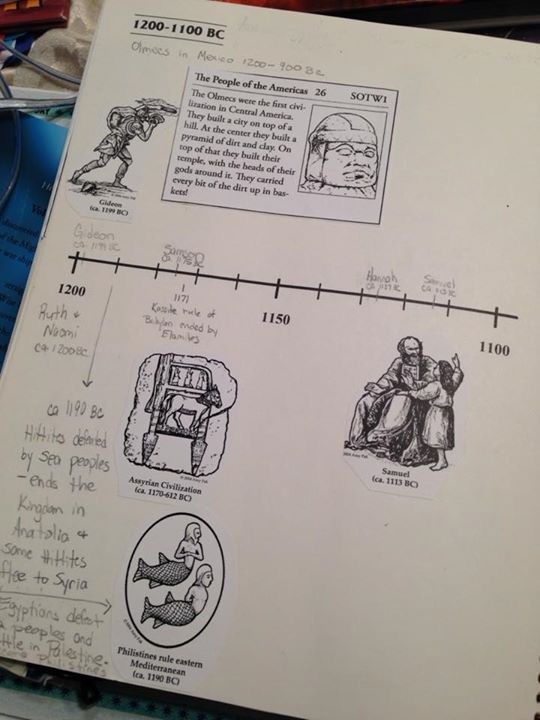 We have also been using Story of the World (in place of Child’s History of the World in Sonlight’s Core B and C – that book just wasn’t working for us). In the Story of the World Activity Guides there are “review cards”. Those make great additions to the timeline book. In the picture above, in the top left corner is our SOTW review card on the Minoans and at the bottom, I cut out a blurb about the Aryans. Another SOTW review card in the picture above. 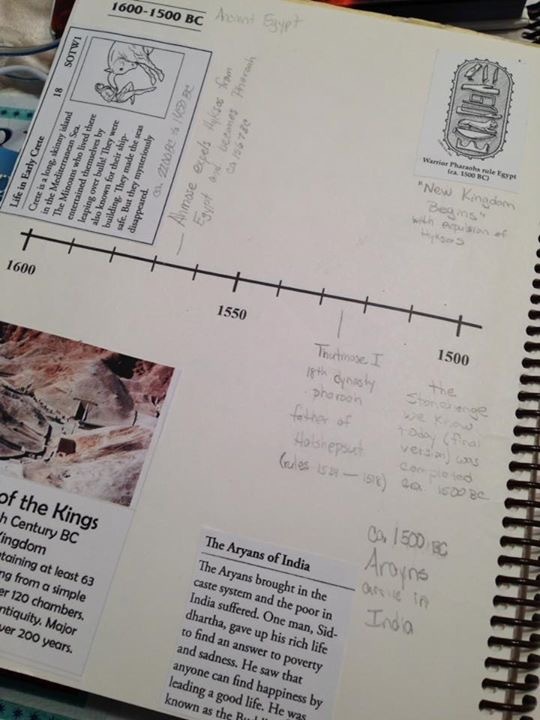 Also, I use the top edge of the page to note Kingdoms or Civilizations or Reigns that begin or end on other pages of the timeline so that if we’re only looking at one page, we can see at a glance the world dynamic. The top of the page above says “Ancient Egypt’. 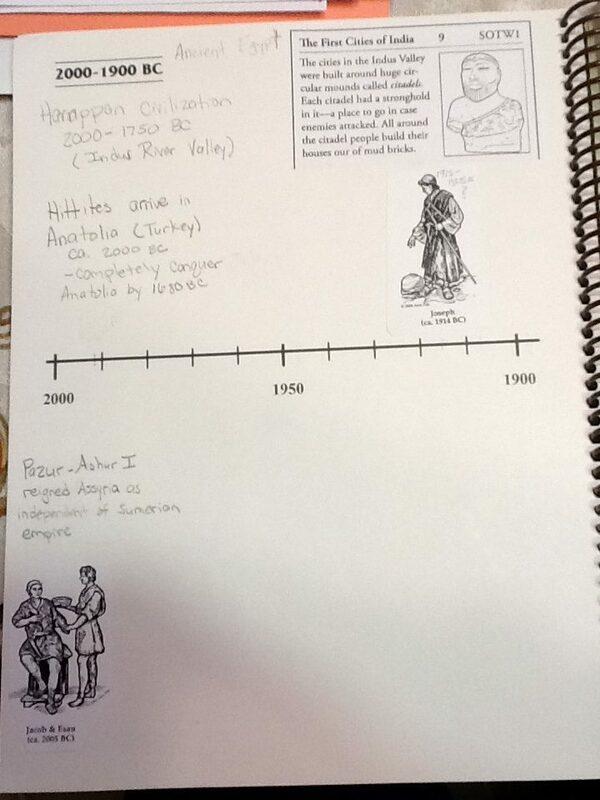 Other pages may have several listings like “Medieval Europe”, “Ming Dynasty” or “Henry VIII’s reign”. You might ask yourself, WHY would I create MORE work for myself? Well, because this book enhances our study of history. We are almost finished with our third year of adding to it and it’s really starting to come together and create this picture of history you can’t get just from reading a book. For example, 1200-1100BC you can see we have Gideon, Ruth and Naomi, Hannah and Samuel and…. the Olmec people in Mexico. Whoa. Had that ever occurred to you? That when Hannah was praying for Samuel, there was an entire civilization living halfway across the world at the same time? I think these are the things we miss when we take history and study it in small chunks. Which, really, is about the only way you CAN study history. BUT when you assemble a timeline, you start to see how all the pieces fit together. For us it makes history a more living subject. We will be adding to this timeline for 8 more years. I can’t wait to see the final result! I hope this has inspired you to make a timeline of your own! 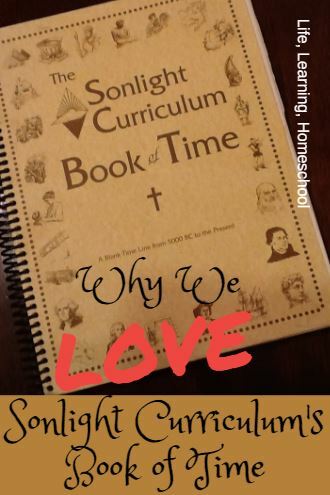 You can purchase the Sonlight Book of Time even if you don’t use the full curriculum.